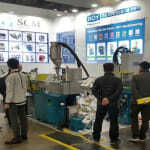 Lots of new contacts, a high customer loyalty and a keen interest in compact injection moulding machines were the result of Boy's appearance at Koplas 2019 in Korea. At the booth of its South Korean representative Scientific Chemical Machinery (SCM), Boy presented two machines of its product range. A Boy XS V with a clamping force of 100 kN and extremely compact dimensions (0.64 m²) demonstrated its efficiency by overmoulding of insert parts. In a 3D-printed mould, the blades of nail files were over-moulded with a plastic handle. The printed mould inserts are a cost-effective alternative to metal moulds for the utilization in prototype building and small batch production. ''Check-cards'' with a three-dimensional surface structure were produced on a Boy 25 E (clamping force 250 kN). Above all the Boy machine of the E-series could convince with the smooth running of the servo drive, which operates extremely dynamically and more energy-efficiently than conventional drive technologies. With a BOX XXS the successful trade fair appearance was supplemented. The Boy XXS was exhibited at the booth of Stratasys. On the smallest of the Boy injection moulding machines (63 kN clamping force) bookmarks were produced on 3D-printed mould inserts. Thus, injection moulded parts are produced with similar physical properties than those which are produced with conventional injection moulds. This is not possible with additive component manufacturing on 3D printers. By using printed mould inserts, plastic parts of almost any material - even glass-fibre reinforced plastics - can be produced cost-effectively even in very small quantities (e.g. for prototyping or spare parts production).